PWSI Courage Cubs 4U - 6U Program is excited to move to the Ali Krieger Sports Complex! The Courage Cubs Program will be offered to players 4U (born 2015), 5U (born 2014), 6U (born 2013). CCP offers an age-appropriate training curriculum that is focused on individual development and creates an exciting, challenging, and competitive environment for our youngest players in the PWSI Courage community. CCP is an eight-week program that will include playing in small-sided games that is aimed at developing basic skills such as dribbling, passing, receiving and shooting in an exciting and fun learning environment. Teams will be coed with up to 8 players per team and are coached in their weekend games by parent volunteer coaches while being directly supported by Courage Cubs Program staff. We would like to welcome Sara and Matt Case as our new Courage Cubs Commissioners for 2019. Should you have any questions or concerns, please feel free to contact cubscommissioner@pwsi.org. CCP players will be provided one team training a week with their designated coach. The training session will be planned and supported by a United States Soccer Federation (USSF) Licensed coach. The PWSI Youth Director, Gabriel Portillo, will work with Courage Staff Coaches to plan training sessions each week which provide a fun and challenging environment for players. PWSI Staff will lead CCP 4U in Fun Drills/Activities on Saturdays. These drills will be designed to build the fundamentals of soccer (ie: Ball Control and Foot Skills). Games will be played Saturdays for CCP 5U - 6U. All Drills/Activities/Games will take place at the AKSC Field #3. 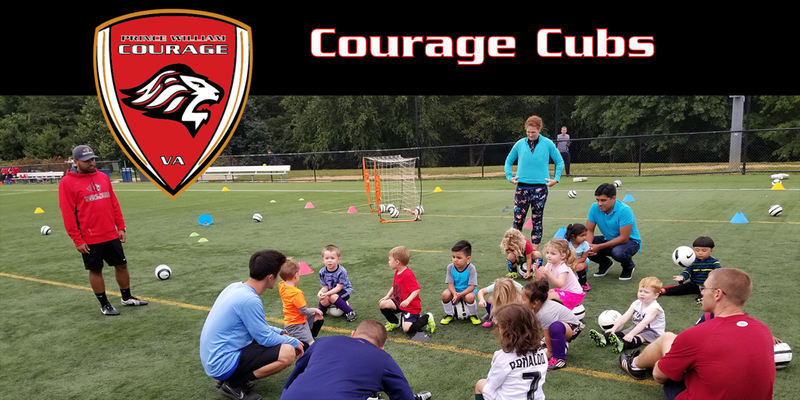 Courage Cubs Program is the perfect soccer program to start children on a life-long path of physical fitness and healthy living. The game of soccer promotes exercise, endurance, inclusion, cooperation, the value of a team, social skills, and the value of effort. This is a perfect way to expose your children to the world's most popular sport and the sport they call “the beautiful game." *CCP 4U Players are not required to purchase a uniform.